The Central Bureau of Investigation (CBI) on Friday arrested former Indian Air Force chief SP Tyagi, his cousin Sanjeev alias Julie, and lawyer Gautam Khaitan for allegedly receiving and facilitating bribes in a `3,727-crore deal aimed at buying AgustaWestland choppers for ferrying government dignitaries. This is the first time a retired service chief has been arrested in India’s military history. Sources said all three were called for questioning on Friday, and later arrested after they “refused to cooperate” with investigators. They will be produced before a court on Saturday, and the CBI is expected to seek their remand for custodial interrogation. The arrests came nearly three years after India scrapped the contract for 12 AW-101 VVIP choppers following allegations of corruption. In an FIR filed in March 2013, the CBI had named 13 people – including the former air force chief; his cousins Sanjeev alias Julie, Rajeev alias Docsa and Sandeep; three alleged middlemen Carlo Gerosa, Christian Michel and Guido Haschke; former Union minister Santosh Bagrodia’s brother Satish Bagrodia; IDS Infotech managing director Partap Aggarwal; Aeromatrix CEO Praveen Bakshi; former Finmeccanica chairman Giuseppe Orsi; former AgustaWestland CEO Bruno Spagnolini; and IDS Infotech legal advisor Gautam Khaitan – as the accused in the case. Six companies – Italy based Finmeccanica, its UK-based subsidiary AgustaWestland, Mohali-based IDS Infotech, Chandigarh-based Aeromatrix, IDS Tunisia and IDS Mauritius – also figured in the report. Investigations gathered pace after an Italian court of appeals pointed fingers at 71-year-old Tyagi in April 2016, observing that there were “unmistakable indications of corruption” by an Indian officer. The VVIP chopper case also led to several disruptions in Parliament. The matter was taken up in both the houses this May. Defence minister Manohar Parrikar had said in the Lok Sabha that some members of the UPA government were the real beneficiaries, while Tyagi only received “chillar” – or small change – from the scam. “It was revealed during an investigation that such undue favours were allegedly shown to the said UK-based private company (AgustaWestland) by accepting illegal gratification from the accused vendors through middlemen and relatives, including his (Tyagi’s) cousin and an advocate. They accepted the illegal gratification for exercising influence through illegal means, or using personal influence over the public servants concerned,” CBI spokesperson Devpreet Singh said. All the three had been questioned by investigators on a previous occasion. 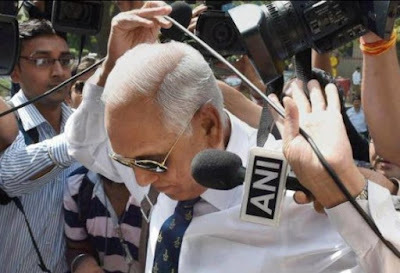 According to the CBI, Tyagi allowed the air force to reduce the service ceiling for choppers from 6,000 metres to 4,500 metres – helping AgustaWestland enter the fray. The firm’s choppers are not capable of flying up to 6,000 metres. Besides this, the agency alleged that Haschke – through his Tunisia-based company Gordian Services Sarl – entered into several consultancy contracts with AgustaWestland from 2004-05 onwards. He also made consultancy contracts with Tyagi’s cousins on a back-to-back basis. The CBI managed to trace at least two remittances totalling 3.26 lakh euros from Hashcke to the trio. Investigators also reported other payments made by Haschke and Gerosa to the accused. The inflow of remittances to the Tyagi cousins’ accounts and the softening of air force’s stand on service ceiling matched closely in terms of time, the CBI alleged. According to the FIR, Haschke and Gerosa managed to send 5.6 million euros to India through Mohali-based IDS Infotech and Chandigarh-based Aeromatric Info Solutions, and kept the remaining sum of the 24.3 million euros received from AgustaWestland for themselves. The agency alleged that British middleman Christian Michel received 30 million of the 51 million-euro kickbacks paid by AgustaWestland. It is suspected that Michel channeled funds to India through a Singapore-based company. India had scrapped the contract with AgustaWestland on January 1, 2014. So this was all about the CBI arrests former air force chief SP Tyagi in AgustaWestland Chopper Case. Hope you liked our article, Keep following us for more details regarding more Jobs and defense news. Feel free to share your views on CBI arrests former air force chief SP Tyagi in AgustaWestland Chopper Case in below comments.